Our Professional DPL Light Therapy® Clinical Anti-Aging System is now designed with an extra large treatment head which covers an 83% larger treatment area, making your therapy quicker. Treat yourself in just 3 MINUTES PER DAY! 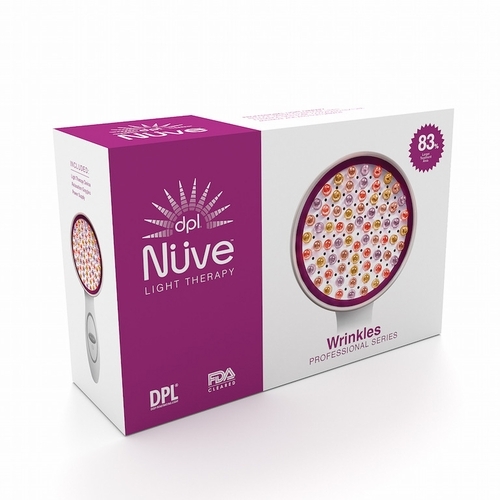 The DPL® Nuve Anti-Aging Handheld is a system of specially designed led light emitting diodes. The device, with 72 LEDs , emits photon energy for use in dermatology for the treatment of fine lines, wrinkles and skin pigmentation. The Device delivers natural light infrared energy. Deep Red, Natural Red and Amber spectrums that are proven to reduce and/or eliminate fine lines and wrinkles. As far as natural wrinkle reduction. 97% of users participating in a clinical study experienced significant reduction of wrinkles. The study showed that DPL medical grade lights treat wrinkles and fine lines while improving skin tone, color and texture. The DPL Light Therapy® Clinical Anti-Aging System is a clinically proven solution that makes the skin look and feel more youthful. It works from the inside out to tackle fine lines, wrinkles, loss of firmness, elasticity, skin dullness, and uneven skin tone. You will see unprecedented results after using it just minutes per day. Treatment in as little as 3 minutes!